I really feel sorry for the owner of the car for selecting such a strategic location to park his car. 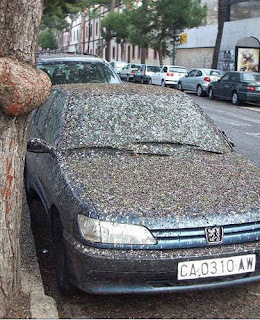 I also feel sorry for the bird for not able to fly away from the tree but efficiently execute the whole design activity on the car. I feel sorry for the car. I really do not know if the car and the bird had any family rivalry. I feel sorry for the human being who was involved in the post-shitting- cleaning activity of the car. The blue cross society should come forward and stop such deadly activities. Underwears should be made compulsory for birds. was that a matured laff? lol.. my mommy says im also lie those bird.. let lose just about anywhere, anytime..
LOl ! This was awesome !!!! And the pic had me in splits...hahahaha !!!!! lol..indeeds! Birdies of birds need to be covered! What a hazard..heh..
this had me in spilts..=))..